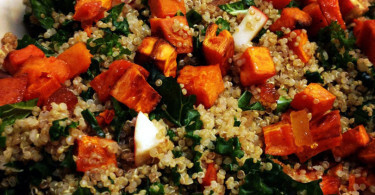 This recipe is relatively easy. It just needs a little time. Perfect for a snowy day like today, when you are stuck in the house, or any lazy winter weekend afternoon. I love those, don’t you? I’ve been meaning to share a short ribs recipe with you for a while. We served them at our graduation buffet back in September and they were quite the hit. I made them again for one of the kids’ birthdays and the family loved them. Both of those times, I prepared the short ribs more classically, with wine and veal stock as the braising liquid. I also over-cooked them and shredded the meat because I was serving a large amount of guests and didn’t have enough to give 2-3 ribs per person. This time, I wanted to serve them on the bone and change up the flavor profile a little bit. I love Korean short ribs but, they are usually barbecued and it is way too cold for that nonsense! I decided to braise them in some tamari (gluten-free soy sauce), brown sugar and rice wine vinegar. So good and it turned out to be a really family-friendly dish. 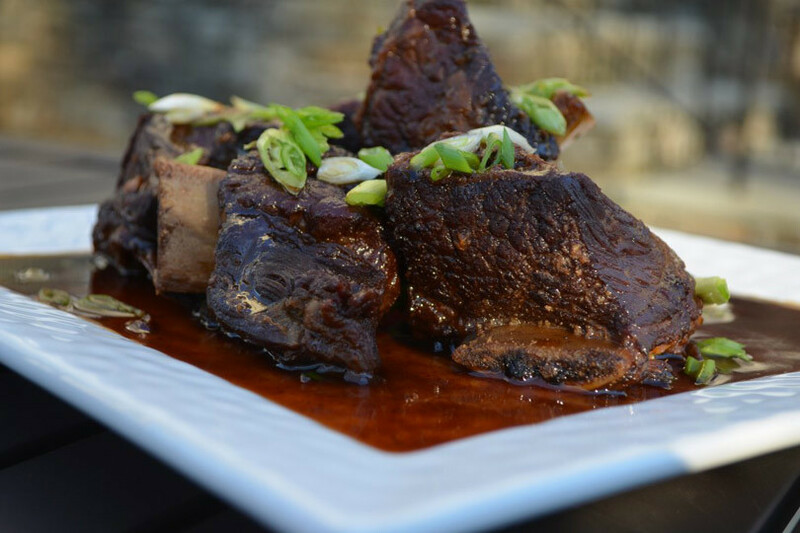 Short ribs are best made a day in advance for a couple of reasons; the flavor develops over time and more importantly, once cooled, it is very easy to remove the fat from the braising liquid so you can have a much more flavorful sauce. I turned the liquid into a thicker glaze at the end by straining out the cooking vegetables and reducing it by half. It was divine. If you are here in the Northeast, stay warm and enjoy the snow! I’m hoping to get the kids out sledding in a couple of hours. We’ll see how that goes…it can be an absolute blast or total chaos with 3 boys. Ha! Making memories is so much fun. Add carrots, celery and onion and sauté, stirring frequently, until browned at edges, about 5 minutes. Add in chopped garlic and continue to stir until fragrant but not burnt, 1-2 minutes. Pour in soy sauce and rice wine vinegar and scrape up all of the browned bits at the bottom of the pan into the sauce. 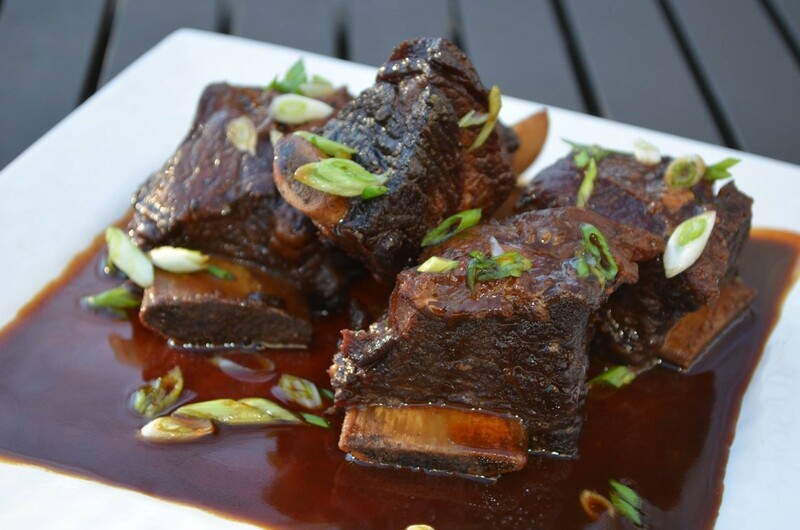 For best results, you should cool the short ribs for an additional 1-2 hours, up to overnight, to easily remove the fat from the braising liquid but, it is not required. I made these for dinner tonight. 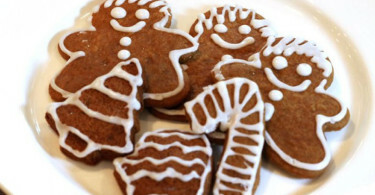 They were very easy to make and came out delicious.